Ever wondered what it was like being a salesman in the seventies? 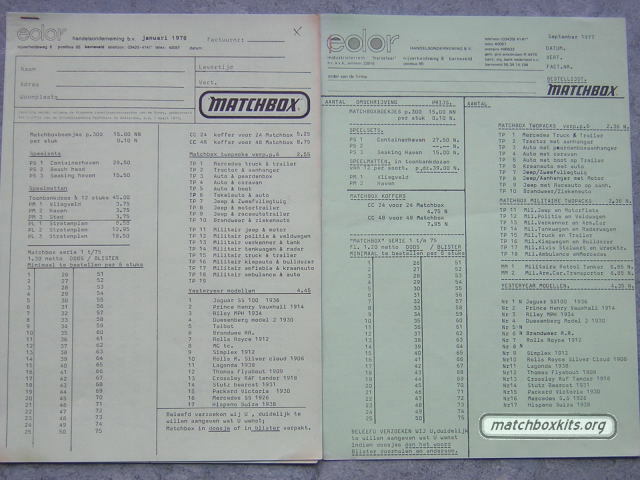 The pictures on the right show order lists that were produced by Edor, the Dutch distributor for Matchbox toys in the seventies. It's almost hard to image that behind the glossy world of the familiar Matchbox Collectors catalogues there was the reality of offices equipped with typewriters not PC's. The lists you see are what your local shop used to order the kits and other toys from their distributor.